A few samples from the Krivoy Rog Iron deposits in Ukraine have been studied to compare them with other Banded Iron Formation (BIF) type deposits in an ongoing project in association with Marta Sosnicka of AGH University, Krakow, Poland. 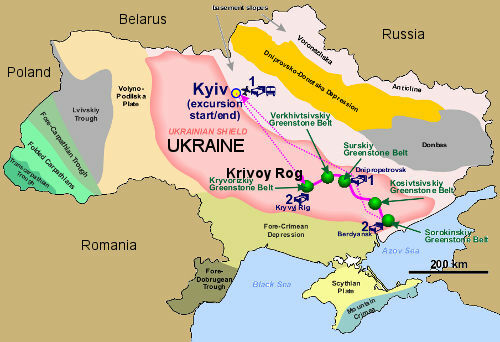 Krivoy Rog is in southern Ukraine some 200 Km from the Black Sea coast. A technical article discussing the Krivoy Rog deposits is available in Economc Geology, Nov 1973. 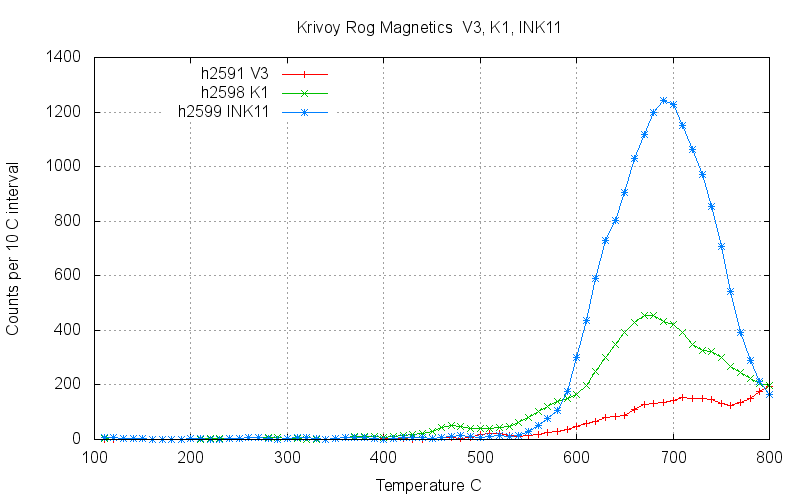 Krivoy Rog is within the Kursk magnetic anomaly, one of the largest and most intense on earth. The Krivoy Rog area is a major source of Fe with many active mines. An initial suite of 12 samples was studied, with 3 additional samples provided later. The sample details are here. Magnetite samples were obtained from the Frunze underground mine, along with a sample of martite. For reference, quartz samples were obtained from 3 nearby areas of surface outcrop. 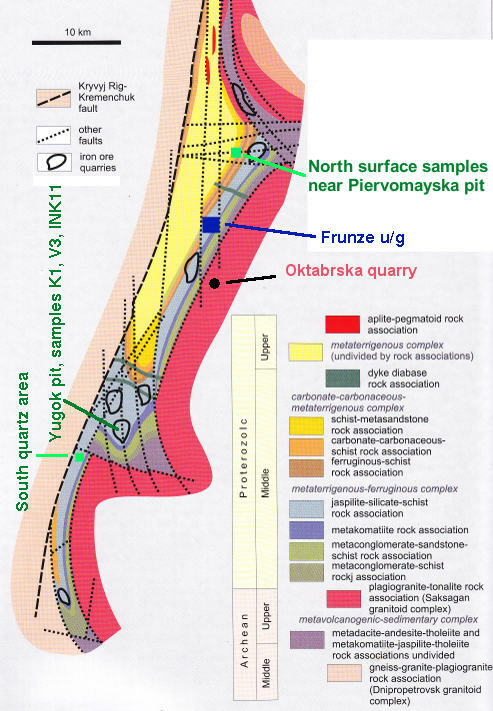 And 3 additional samples, K1, INK11 and V3 from the Yugok pit were also studied later. The iron deposit is a metamorphosed Banded Iron Formation and this photo is a museum specimen sample from Krivoy Rog, photographed by Siim Sepp. Bobrov, O.B., Gurskiy, D.S., Krasnozhon, M.D., Malyuk, B.I., Shcherbak, M.P., Kalinin, V.I., et al., 2002, Main types of rock complexes and mineral deposits in the Ukrainian Shield, Geological Excursion Guidebook, Ukrainian State Geological Survey, Kiev. During sample preparation, the hand specimens were described. Some of the quartz samples were described as cherty because they were very fine grained and of vitreous appearance, while others were considered to be of hydrothermal quartz vein origin as they were coarsely crystalline. When decrepitated, these two types of quartz are quite distinct as chert gives no significant decrepitation because it formed at low temperatures and fluid inclusions are either very small or absent. Samples 1892, 1893 and 1894 were described as being of cherty appearance and these show very weak or no decrepitation here. These samples may be comprised dominantly of sedimentary banded chert silica. In addition, sample 1894 (analysis h2540) also has weak decrepitation, although it was not described as being cherty and cannot be a chert as it crosscuts the granite! The vein quartz samples show typically intense decrepitation confirming a hydrothermal or metamorphic origin. 3 of these 5 samples show low temperature decrepitation caused by CO2 rich fluid inclusions. But note that sample 1892A (analysis h2534, red) is very different from sample 1892B (analysis h2535, green) despite being collected close together. The 2 quartz samples from the Frunze mine, shown in blue and magenta (h2538 & h2539) are similar and contain some CO2 rich fluid inclusions which decrepitate at 230 C, which is a much lower temperature than the surface quartz samples. This low temperature may be caused by a very high partial pressure of CO2 in the inclusions from the Frunze mine quartz. 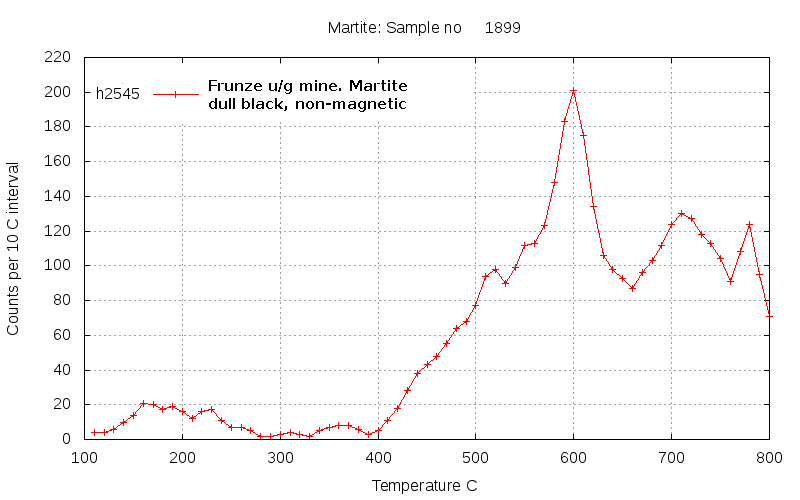 The magnetite samples from the Frunze mine show considerable decrepitation, not unlike magnetites from skarn deposits. Sample 1898A (red) has a prominent double peak indicating 2 very distinct fluid inclusion populations are present. The inclusions in these magnetites are thought to have been introduced during a regional metamorphic event as these deposits are not considered to be skarns of high temperature hydrothermal origin. Unmetamorphosed sedimentary magnetites would not decrepitate at all as they would lack the necessary high pressure/temperature fluid inclusions. Martite is an alteration mineral, a pseudomorph of haematite after magnetite. It shows only a minor amount of decrepitation because it lacks fluid inclusions, which were probably destroyed during the alteration of the parent magnetite. The second group of samples, V3 (2137), K1 (2139) and INK11 (2138), from the Yugok open pit. 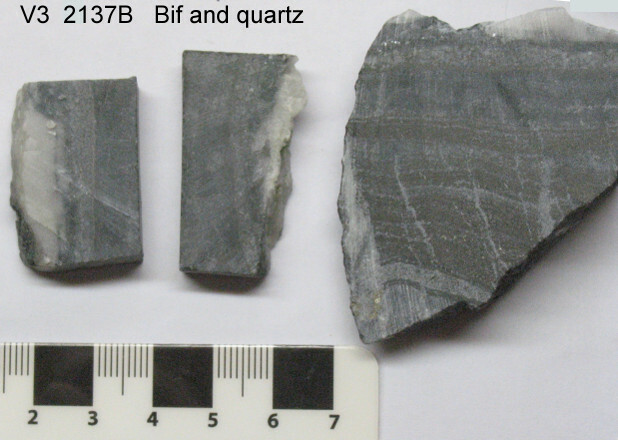 The second group of samples included number V3 which was split into 2 subsamples, 2137A (crosscutting quartz) and 2137B (host BIF) during preparation. These samples were further split into magnetic and non-magnetic fractions and also coarse grainsize (<420, >200 micron) and fine grainsize (<200, >100 micron) fractions before being analysed. The different aspects of these 3 samples can be seen in this photo of sample 2137 (V3) including crosscutting clean quartz vein material (2137A) and the fine grained banded chert - magnetite BIF (2137B). 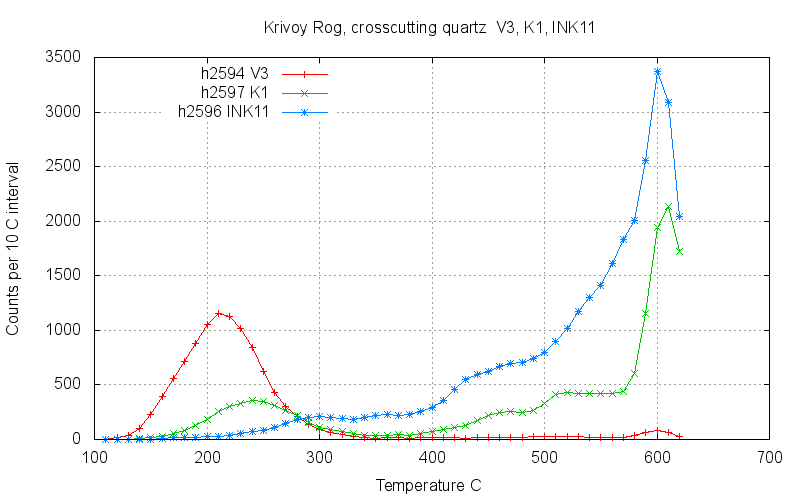 The crosscutting quartz in sample 2137B , shown here in red, had extremely intense low temperature decrepitation near 200 C. Low temperature decrepitation such as this is usually caused by high CO2 contents in the inclusions. However this peak is more intense and at lower temperature than is usual. Crushed grains of the sample were immersed in a refractive index oil (clove oil) to try and identify the cause of this unusual decrepitation behaviour. Abundant fluid inclusions were seen, but they were only small, typically 5 to 8 microns across only. And the fluid content was usually dominated by a single vapour phase with very little water present. Angular inclusion contents were very common indicating the presence of a solid phase. This was not cubic and could not be halite, and was unidentified in these observations. Bubbles were seen only rarely in the smaller inclusions which were less than 2 microns across. These observations failed to identify a CO2 rich fluid which could cause the decrepitation. In the other samples, 2138 and 2139, M. Sosnicka identified abundant nahcolite ( NaHCO3 ) solid phases in the inclusions.The unidentified solid in sample 2137 is probably also nahcolite. Nahcolite decomposes at 270 C giving off CO2 (at 1 atmosphere pressure) and it seems likely that the low temperature decrepitation peak is caused by decomposition of nahcolite in combination with already high CO2 contents in the inclusions. 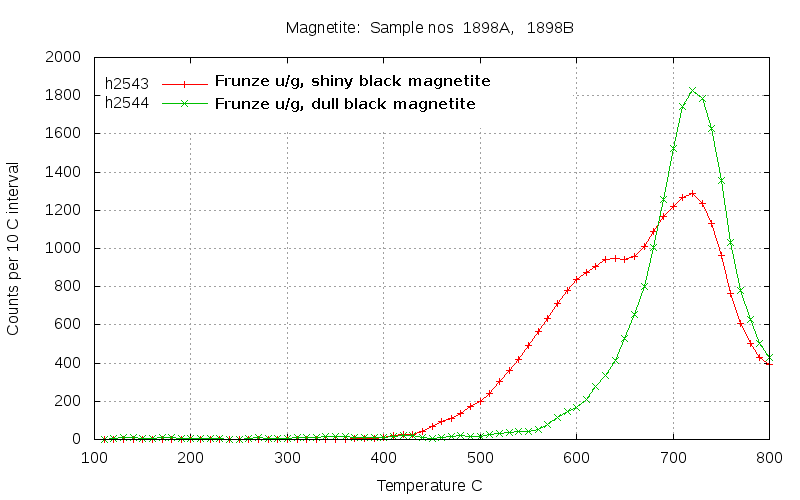 The magnetic fraction from the BIF (shown in green) in this sample (2137A) does not decrepitate at low temperature, presumably because the magnetite does not contain nahcolite. Decrepitation in the magnetite occurs only above 600 C and is interpreted to be the result of inclusion growth during recrystallization at the known regional metamorphic conditions. The non-magnetic chert fraction from the BIF (shown in blue) in this sample (2137A) does not decrepitate at all, which is typical of fine grained cherts, regardless of subsequent metamorphism. It is clear that the fluids within the crosscutting quartz vein, 2137B, are quite different to those in the BIF magnetics, 2137A. Although this is not really surprising, it does highlight the necessity to avoid assuming that fluid inclusions in quartz are representative of the formation conditions of associated opaque minerals. This is also discussed for pyrite samples here. Quartz is always used to study fluid inclusions simply because it is transparent, a requirement for microthermometry. But this data from quartz is then assumed to apply to co-existing opaque minerals. This decrepitation data shows that this assumption is frequently invalid. The metamorphic fluids which upgraded the BIF to ore grade magnetite removed silica. But the fluids in the crosscutting quartz vein were clearly depositing silica and cannot tell us much about the fluid environment during ore formation. Sample 2139 also shows a prominent low temperature decrepitation peak in the crosscutting quartz vein, shown in red. This is again presumed to be due to the presence of nahcolite which M. Sosnicka identified in this sample. The peak is at slightly higher temperature but the reason for this is unknown. 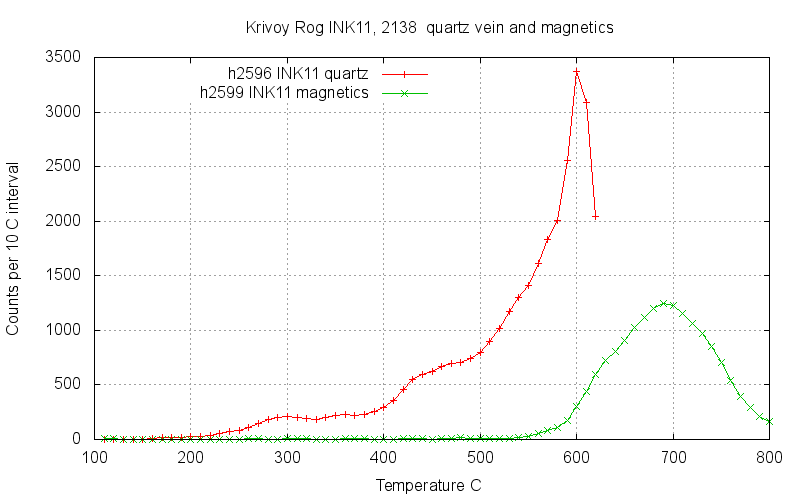 But there are also other populations of fluid inclusions in this sample which did not occur in sample 2137.The decrepitation in quartz (red curve) at 460 C is matched with decrepitation in magnetite (green curve). This and the higher temperature decrepitation peaks in the quartz may well represent the same fluids that cause the decrepitation peak at 670 C in the magnetite. The chert from the BIF was not analysed. The following graphs show the same results as above but grouped by sample type instead of sample number to highlight the similarities and differences within this suite of samples. The crosscutting quartz samples shows the change in temperature and intensity of the low temperature decrepitation. There is not enough data to attribute this change to variations in the amount of nahcolite present, although this may be the cause. 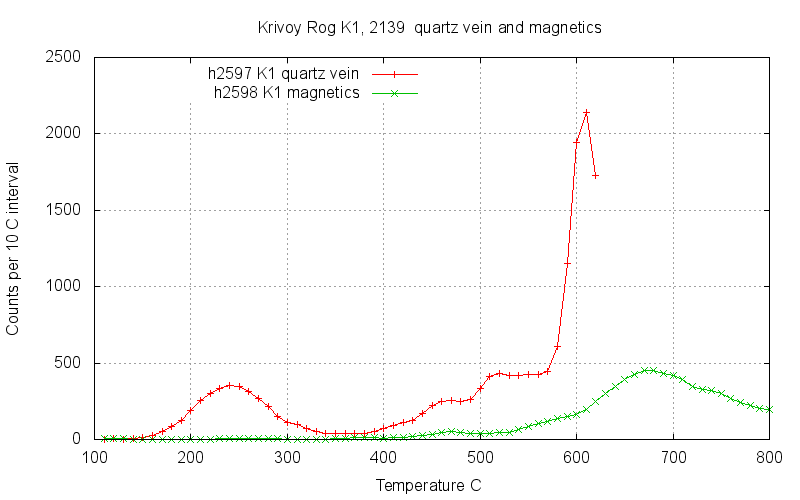 The magnetic fractions from the BIF show similar high temperature decrepitation on all of the samples, as would be expected with inclusions resulting from a regional metamorphic event. However, there are also some interesting differences and further studies are required to understand these changes. Sample 2137 was also used for comparisons between different analytical grainsize fractions and magnetic fractions and this information is discussed here. Great Bear magmatic zone, Canada. Mengku, China. Tennant Creek, Australia. An overview of FeOx data. and additional FeOx data. 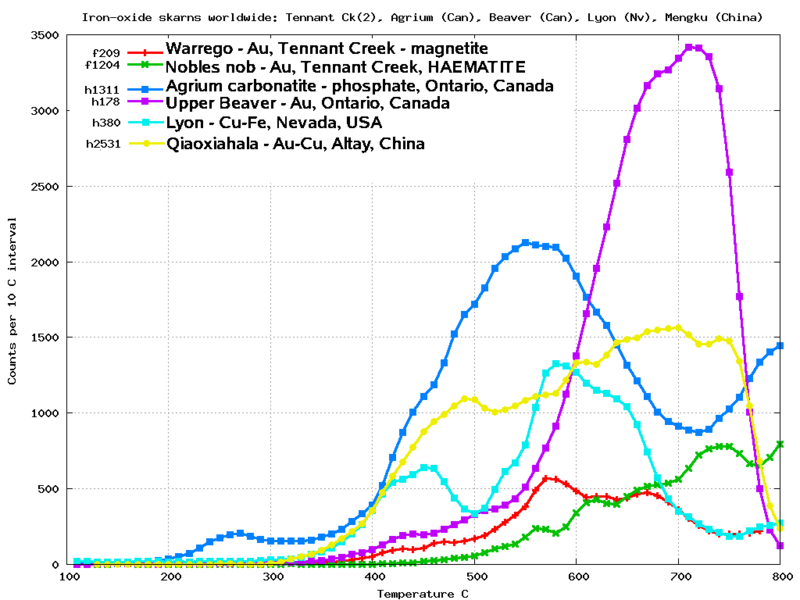 For comparison, here are some typical decrepitation results from other magnetite deposits and skarns. An additional discussion contrasting Skarn magnetites with BIF magnetites is here. Decrepitation is an effective way to study magnetites and haematites because you cannot use optical microscopy on these minerals, leaving very few other methods to obtain fluid inclusion data. Although fluid inclusions within these opaque minerals are less well understood than inclusions within transparent minerals, the same principles apply and we can see marked differences between deposit styles and samples. The method can be used to help discriminate between low temperature and hydrothermal origins for Fe-oxide minerals. For example, it distinguishes between skarn and BIF deposits. Although CO2 rich fluid inclusions within magnetite should produce the same low temperature decrepitation effect that we frequently see on quartz samples, very few magnetites have such low temperature decrepitation peaks. 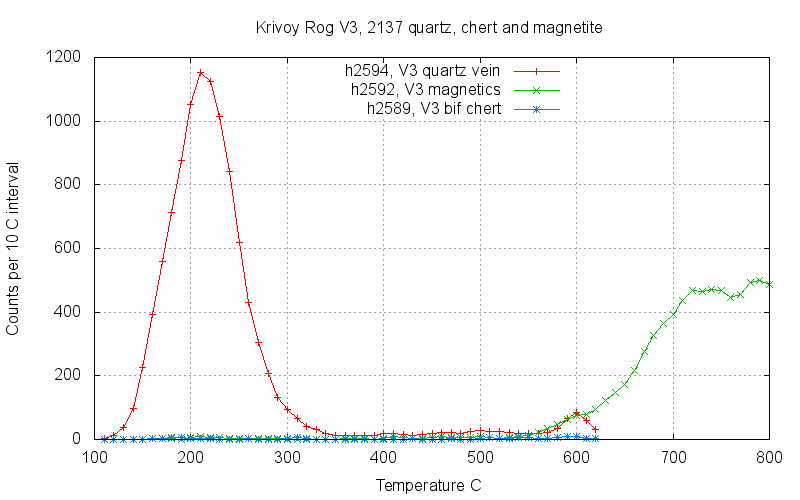 The 3 magnetite samples from the Frunze mine and Yugok pit at Krivoy Rog do not show low temperature decrepitation and it is inferred that the fluids here were aqueous and had very low CO2 content. Such low CO2 content fluids seem to be a feature of magnetite samples from BIF deposits. 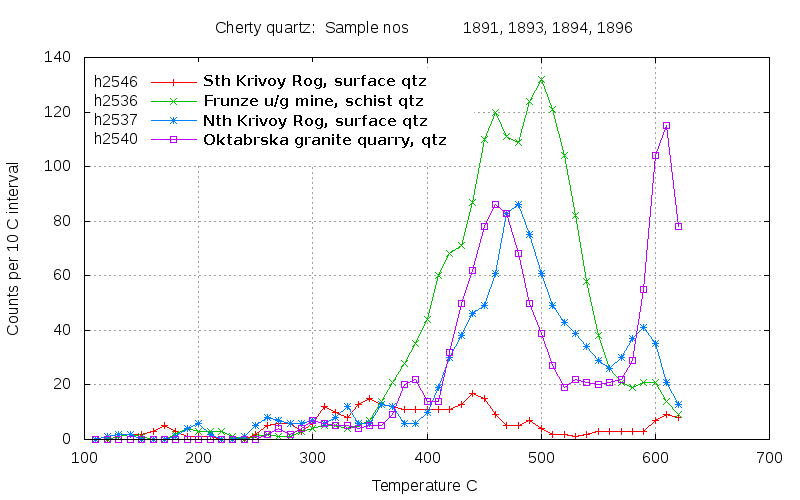 However there are two quartz samples in the Frunze mine which do have a (small) low temperature CO2 decrepitation peak (1895A & 1895B; H2538 & H2539) as well as an intense CO2 decrepitation peak on quartz from the Yugok pit (2137; H2594). This suggests that there were multiple fluid stages. Although many more samples are required to understand this system, perhaps there was an early stage pervasive event (regional metamorphic?) with low CO2 content fluids, and subsequent quartz veining with a different and CO2 rich fluid with only localised influence. 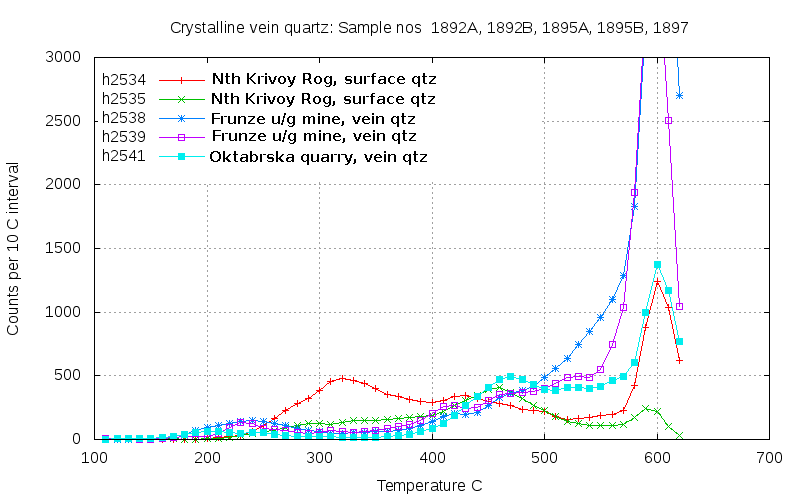 The microthermometric studies by M. Sosnicka show that the crosscutting quartz samples were formed from a CO2 rich fluid which also deposited nahcolite. This fluid was determined to have come from a nearby carbonate-containing rocks during the regional metamorphism. Acknowledgement: Special thanks to M. Sosnicka for providing these samples and for associated geological information.